In every company, there will come a time where an employee may not be able to attend work. When that happens, it is the responsibility of that particular employee’s supervisor to take note of the employee’s name, as well as other details such as why the employee is absent. You may also see sample report templates. The reason as to why this needs to be done is because it is required that every absence within a business must be reported to management as the information can affect an employee’s payroll as well as other things within the company. 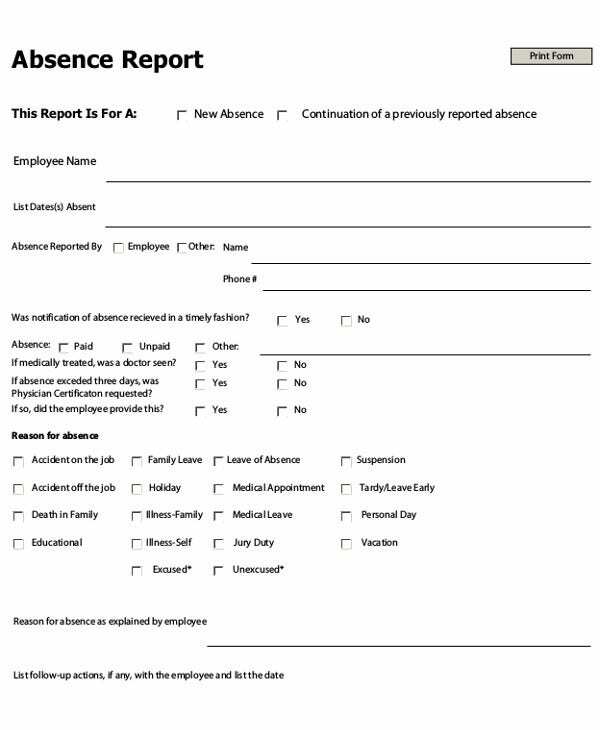 This is why one would need to learn how to create an absence report and this article will teach you how to do just that. 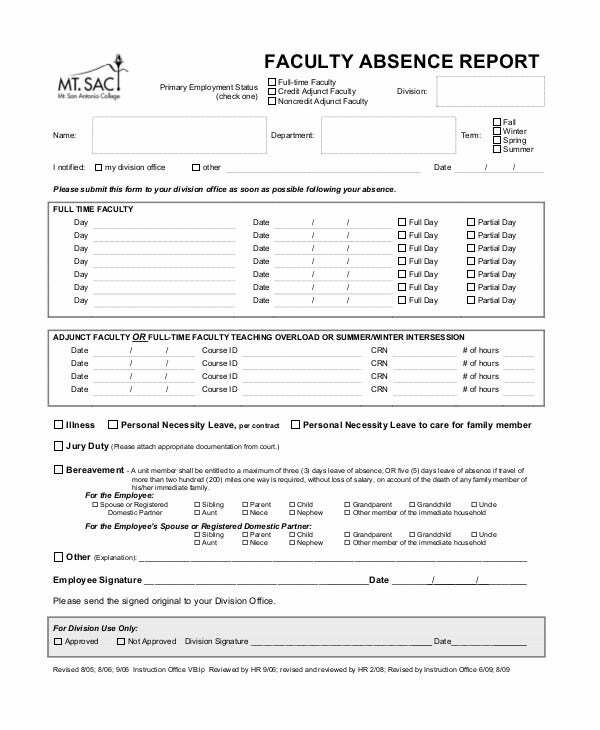 If you’re the person that has been assigned to manage the attendance of all the employees within a particular department within your company, then you should know how to create a proper absence report samples. So, here are the things that you’re going to have to do when making one. 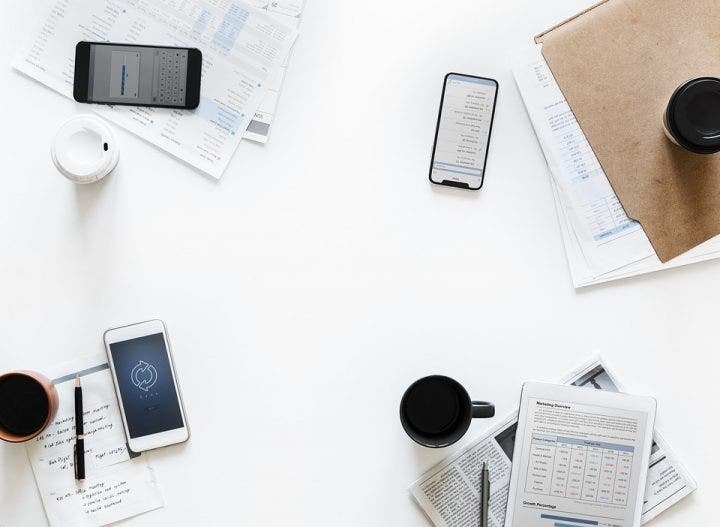 While there are many ways in which you can make your own report, it’s always best that you download whatever software or application that can help you as it’s better than just writing everything down by hand. You can make use of an automated system wherein the attendance tracker you make will automatically update once you’ve placed in the information. 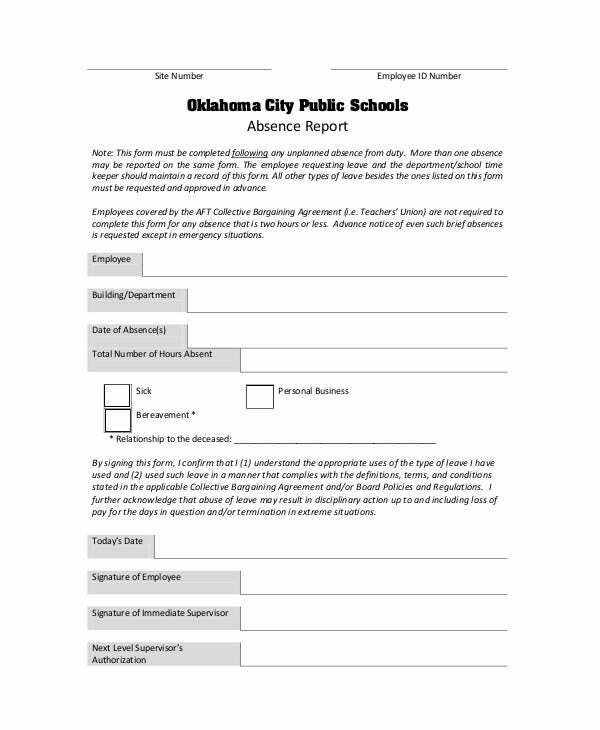 You may also see HR report templates. While you can always go with Word programs such as Microsoft Word or even Microsoft Excel, there are still countless others that you can find all over the net. Just make sure that you’re going to use one that you are comfortable with or one which your company requires you to utilize. If you’re going to keep track of the people that aren’t reporting to work, then you need to have all the employee’s basic information into the report. You will want to know who that person is and management would also like to find out as they will be using the information to help them decide on certain disciplinary actions (assuming that it’s needed). 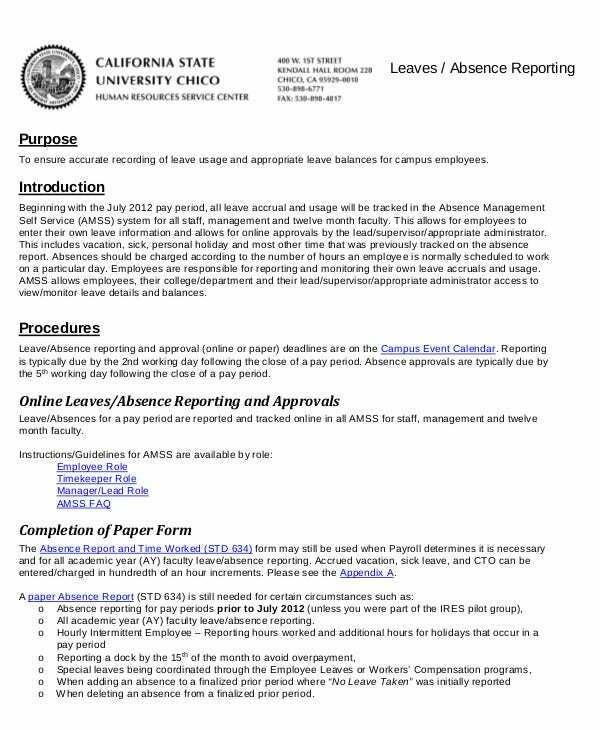 So, what you’re going to have to write down is the complete name of the employee or employees that have not attended work (last name, first name, and middle initial) as well as the employee’s job title into the report. Just make sure that you don’t misspell that employee’s name to validate his/her absence. You may also see excel report templates. 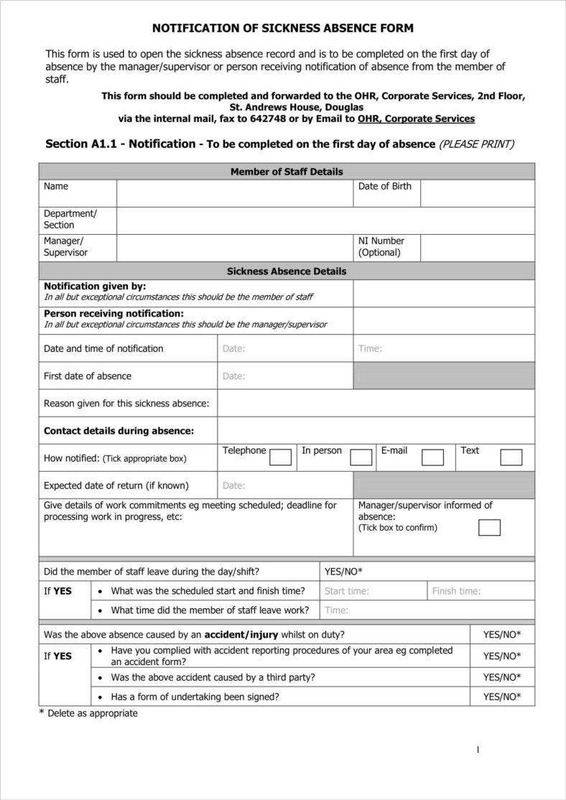 If you’re going to report an absence within your department, then you’ll need to specify the date on which the employee or employees were absent as management will need the information for record-keeping purposes. So, while you will be in the process of creating the report, you will need to write down the specific date on which the employee was absent; meaning that you’ll need to provide specific details such as the day, month, and year. You may also see sample performance report templates. If the employee has already been absent for more than one day, then the next report you’re going to make should state the day on which the employee has started his/her absence, and the day on which you’ve made the weekly report. Just because the employee isn’t present at work does not mean that he/she made an unannounced absence. There’s always that chance that the employee may have filed for a vacation leave as he or she may have needed a break. So, while you’re creating the absence report, you’re going to have to write down just what kind of absence the employee took. So, if it’s an absence because of sick or vacation leave, then you’ll have to type down the exact reason into the document. If it’s an unannounced absence? Then write that down in the document. Just make sure that you state this within the report as this can heavily affect the employee’s payroll sample and possibly even his/her status within the company. This is especially important if the employee did not announce that he or she would not be present in the workplace on a particular date. You’ll want the employee to write down in full detail as to why he or she was not at work. 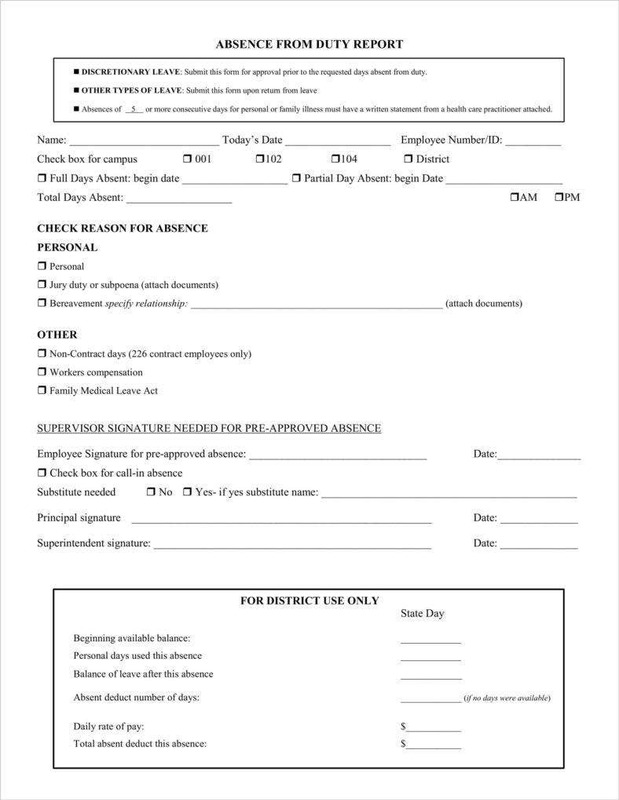 Management is going to need this as the reason may determine whether the employee will require disciplinary action, or whether the absence is understandable and the employee will only have to go through minor consequences such as having a small discussion with management regarding the absence. 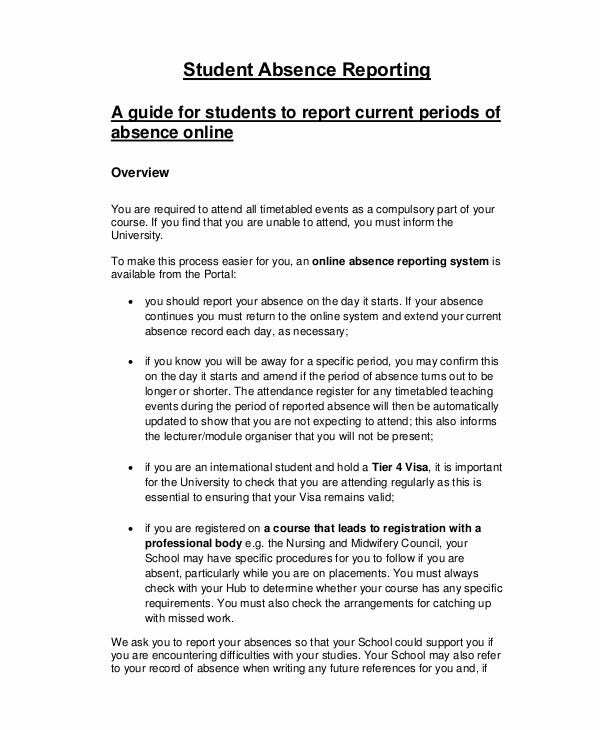 Now that you’ve learned how to create an absence report, it’s also a good idea for you to learn how to manage the number of absences within the workplace. Employee absence is an unavoidable part of running a small business. But, without effective management, it may escalate to the point where a minor inconvenience can end up becoming a major problem for the company. Thankfully, there are steps that you can take which will enable you to properly manage these absences which don’t infringe on employees’ “right to be ill”. By offering rewards to those employees who come to work without taking any sort of absence, you’re basically giving these people more reason to want to go to work. With a few safeguards and ground rules in place, some companies offer substantial awards for non-absence. This can include anything from cash rewards or possibly even a number of extra vacation days for the employee who has shown commitment. Just be sure that you’re clear on how the employees will acquire these prizes as you don’t want people to take advantage of this. You may also like monthly report samples. If you’re going to give your employees the bare minimum of holidays, then there’s a huge chance that these people will make up for lack of rest time by taking more leaves which will then lead to the production and performance rate of your company to dip down. One of the best ways of preventing this from happening is by allocating more holidays. Since these holidays are planned, they’re much less disruptive to the operations of your business and it’ll make your employees want to say with the company and possibly even do a little more work than usual. you may also like monthly reports in pdf. You have to make sure that you keep all the records of every employee absence within your department. The reason for this is because you need to see if there are certain trends or maybe even habits that will require you to intervene; it may even be possible that the employee who has made continuous absences will require disciplinary actions. Remember that there is always software that you can use to help you keep track of who’s in the office and who aren’t. You may also see free weekly reports. No matter what kind of company you’re in, there’s always going to be rules and procedures regarding how you will go about in reporting who isn’t present in the workplace. If your company doesn’t have that particular company policy, then you should suggest that one be made. Be sure that the policy covers everything from how the employee will report that he or she isn’t able to attend work, the time in which they should make the report, and how the supervisors should go about in creating their own report for the employee absence. If the employee knows that there’s a policy regarding absence, then that person would least likely make an unannounced absence due to the repercussions. Just like the stipulation that employees phone in sick, return-to-work interviews after any time off that the employee has taken will not only produce a record for the day, but it can also help identify any issue in the future. Who knows? That particular reason that was discussed in the interview may come up again the next time the employee is absent. You may also like project report formats. 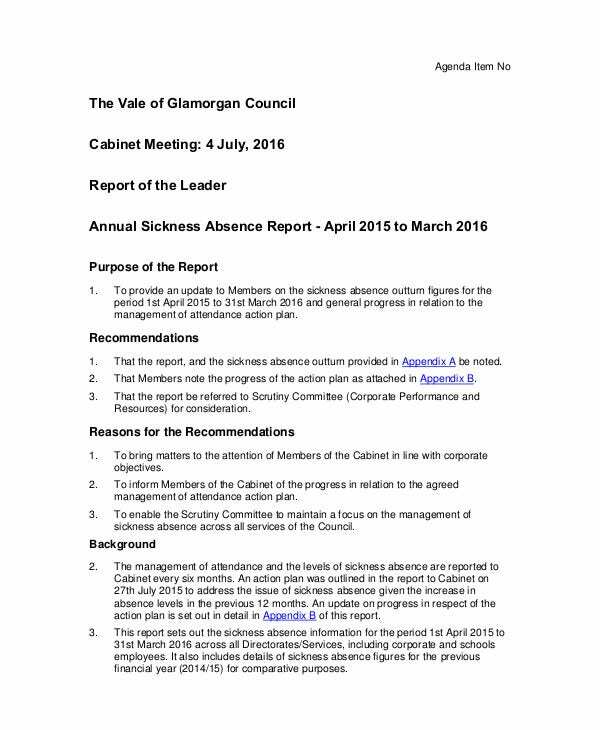 You have to make sure that everyone is treated equally when it comes to the matter of absences. 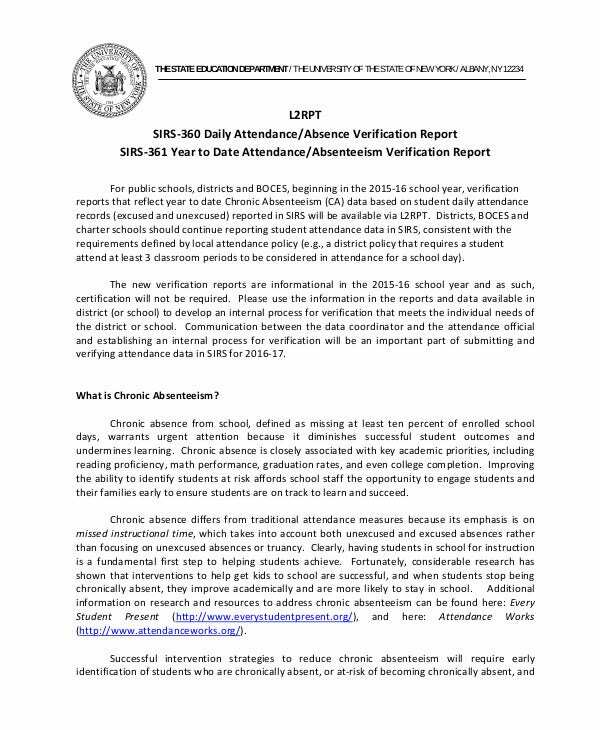 You don’t want to be seen as someone that’s biased and the only way to prevent that is by making sure that everyone is subjected to the procedure of absence reporting. Because if the employees see that you’re showing preferential treatment to a particular few, especially those with higher positions, then don’t be surprised to see a bunch resignation letters or be charged with unfair treatment. By simply making the workplace environment a pleasant and welcoming place, there’s a huge possibility that your employees might never want to take a leave of absence from work. The only thing that you need to do on your end is to make sure that your employees are comfortable with their working conditions and that you respond to whatever employee complaints you receive. There are some people who just can’t stand having to work on a fixed schedule. So, to help them with that, you can always opt for your company to have flexible hours. This is a good incentive to tell the employee that he or she can come into work at any time so long as he or she is able to provide the exact number of hours of work for the company. In the event that you would like to learn more about how to create an absence report or any other type of report, then all you have to do is go through our site, find the articles that contain the information you need, and utilize what you’ve been able to learn to help you and your simple business.